Requires patient′s consent prior to administration. 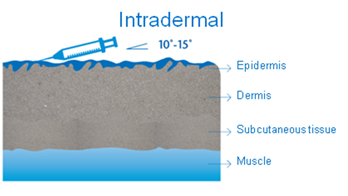 Vaxira® is administered intradermally, in four different sites. 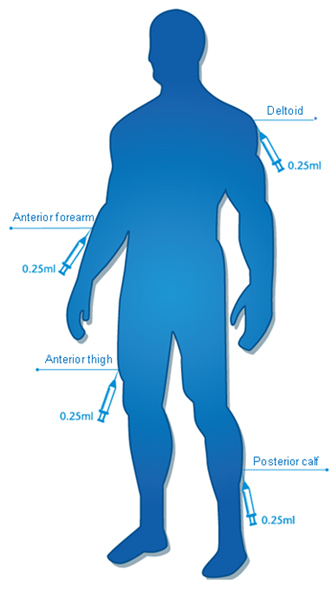 If 2 sub-doses are administered in the same region, both administration sites should be, at least, 5 cm apart. The first five doses are administered at 14-day intervals. This step is crucial to achieve a good level of seroconversion and immunogenicity, thus yielding high levels of antibodies against Racotumomab and NeuGcGM3. It is recommended that the patient remains under observation for one hour after receiving the first 2 doses of Vaxira® to ensure immediate detection of possible adverse reactions and subsequent treatment. The patient need not remain under observation after subsequent doses if no adverse reactions had been previously observed, unless the physician considers otherwise. Only symptomatic treatment is suggested if necessary. There is no evidence that would suggest the need to administer any medication prior to vaccination with Vaxira®. When the induction phase is completed, the patient receives booster doses every 28 days until unacceptable toxicity or deterioration of the patient’s general condition. Disease progression, either from the symptomatic or radiological standpoint, is not a cause to stop vaccination. The vaccine can be administered concurrently with other standard chemotherapies. VAXIRA® vials should be inspected before use. In the case the solution appears cloudy or discolored, it should not be used. The product contains no preservative in the formulation; therefore, it should be used immediately after opening the vial.